Not doing lots of tatting still... but needed a new pair of earrings to match a blouse. 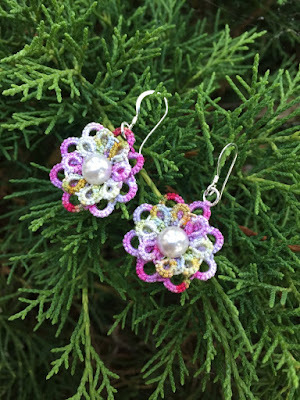 I always like making these flower earrings. They are light and comfortable to wear but also keep their shape due to the layered design. The pearl in the centre also adds strength and stability. The thread I used is a lovely hand-dyed thread made by Karen Solomon of Graceful Arts Fiber Studio. I do like her threads and the way the colours are more random rather than in a sequence as in most other variegated threads. The thread is called "Watermelon". Very pretty! I bet they look wonderful with your blouse! Beautiful earrings and the thread too. These earrings are so pretty, is the pattern available to purchase anywhere?